SAN DIEGO (CNS) — Three archbishops and nine bishops representing at least 13 million Catholics from Sacramento to the Mexican coastal city of Ensenada have resurrected their “Alta-Baja” friendship, paving the way to potentially working together in the future. 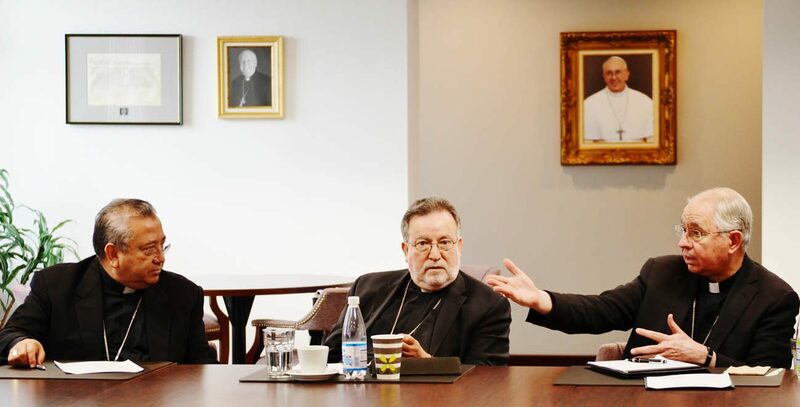 Los Angeles Archbishop Jose H. Gomez and Archbishop Francisco Moreno Barron of Tijuana, Mexico, had worked with their respective episcopal organizations for more than a year to coordinate a meeting of the two sides. Their efforts culminated in an “Encuentro de los Obispos de Alta y Baja California” held recently in the San Diego Diocese. The California Conference of Catholic Bishops organized the participants north of the border, which included San Francisco Archbishop Salvatore J. Cordileone and seven bishops. The conference’s president, Sacramento Bishop Jaime Soto, chaired the meeting, and its vice president, San Diego Bishop Robert W. McElroy, hosted the Oct. 30 event, which ended with a dinner. The Tijuana Archdiocese coordinated the participation of its retired archbishop and the bishops of Ensenada and Mexicali. The purpose of the six-hour meeting was for the leaders from one side of the border to meet their counterparts from the other, and see where the conversation took them. The bishops spoke candidly, often one elaborating on a point raised by one of their colleagues. They shared what was occurring in their individual dioceses regarding issues of common interest, such as immigration; the North American Free Trade Agreement, known as NAFTA; and “Laudato Si’,” Pope Francis’ call to protect the environment. Regarding immigration, the California bishops described how the Trump administration’s executive orders related to immigration had sowed fear in their dioceses as deportations increased. For their part, the Baja California bishops said the deported migrants face bleak conditions in their communities, which lacked the resources to assist them. By the end, the bishops committed to meeting next October, this time in Baja California, to explore ways they could work together to strengthen each other’s ministry. “This was the resurrection of Alta-Baja,” said Archbishop Gomez, referring to the name of the group of bishops from both sides of the California-Mexico border that had met regularly until the early 2000s. “Alta,” which means “higher” in Spanish, and “Baja” California, or “lower,” were once one territory. In the 19th century, the vast area was governed first by Spain and then by Mexico. Alta California became part of the United States in the Treaty of Hidalgo of 1848, which ended the Mexican-American War. Archbishop Gomez noted that when Pope Francis visited Mexico last year, he urged the bishops there to step up their coordination with their U.S. counterparts, given that so many Latino Catholics live north of the border. “I think it’s important to find new ways to help our people to grow in their spirituality and to grow in their missionary spirit,” Archbishop Gomez said. Tijuana’s Archbishop Moreno Barron said the most important outcome of the gathering was the opportunity to meet each other — and to build from there. At the meeting, the Tijuana archbishop said he had recently attended a meeting of a group of bishops from the Texas-Mexico border, known as Tex-Mex. He expressed the hope that a bishop from that organization could join next year’s meeting of the Alta-Baja bishops. Archbishop Gomez participated in Tex-Mex during the five years he served in San Antonio. He’s familiar with the benefits and challenges of working on cross-border projects. The participants from California included Bishops Michael C. Barber of Oakland, Gerald R. Barnes of San Bernardino, Richard J. Garcia of Monterey, Armando X. Ochoa of Fresno and Auxiliary Bishops Alexander Salazar of Los Angeles and John P. Dolan of San Diego. From Baja California, Bishops Jose Isidro Guerrero Macias of Mexicali and Rafael Valdez Torres of Ensenada participated, as did retired Tijuana Archbishop Rafael Romo Munoz. Bustos writes for The Southern Cross, newspaper of the Diocese of San Diego.